This is a show I had never even heard of until I spotted it on Amazon Prime and thought I’d give it a go. I’ll be honest, I didn’t really know what to expect with this, I was just drawn in by the Amazon Prime description. Set in the late 1980s, Hap and Leonard is a darkly comic swamp noir story of two best friends, one femme fatale, a crew of washed-up revolutionaries, a pair of murderous psycho-killers, some lost loot, and the fuzz. Oh. Hell. Yes. And then it just got better. It’s 1968. A couple of robbers, one of whom has been shot, are making their escape along dirt roads with the police in hot pursuit. They take a wrong turn, head down a track that says road closed and end up in the river. As you do. The car sinks without trace and only one of them seems to escape with a handful of cash but the inevitable sirens are closing in. Flash forward to 1988 and we meet our two heroes Hap Collins (the sublime James Purefoy) and Leonard Pine (Michael Kenneth Williams, whom I knew from being “Chalky” White in Boardwalk Empire) tending a crop of roses as farm labourers, only to find they are done out of a job by cheaper Mexican labour coming in when a nearby farm closes down. Back at Hap’s house, his ex Trudy (Madmen’s Christina Hendricks) shows up while the boys are letting off steam by shooting skeets. Leonard doesn’t like her and leaves so Hap invites her up to the house for coffee. They talk about the old days, back in the sixties, and when Trudy gave Leonard hell for joining the military, hence his dislike of her, and all Trudy’s failed relationships since she split up with Hap. The reminiscing leads to dancing to a song on the radio, leads to... erm... other stuff.... Anyway. In the middle of the night the phone goes and it’s Leonard checking up on Hap. They too talk a while about why Trudy is still there and the military and the sixties but it doesn’t lead to dancing or anything else. As Hap is staring at an empty bird cage, thinking about how old he’s getting, and how much he looks like his father now, the real reason for Trudy’s visit transpires as she needs a favour. How would Hap like to make $200,000? And so the story is set up. 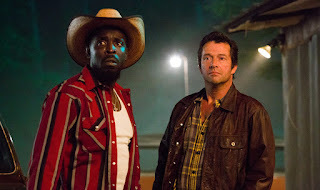 Hap talks Leonard into helping him out and together the three of them set out to try and recover the money that ended up at the bottom of the river in the robbers’ car all those years ago, avoiding the cops and running into Trudy’s ex, Howard, and his 1960’s anti-establishment commune along the way. And the murderous psycho killers? Are psycho, yes. OK, first things first. Anything that calls itself swamp noir and starts off in 1968 Texas with a police car chase, to the strains of Up Around the Bend by Creedence Clearwater Revival and rivals anything Smokey and the Bandit or Dukes of Hazzard ever did, is off to a very very good start in my book. I didn’t even know who was in the cast when I started watching, and I would have been even more keen to watch if I had. James Purefoy is brilliant in anything he touches, Michael Kenneth Williams was a joy to watch in Boardwalk and I’ve always thought Christina Hendricks was sadly underused in Madmen. What I got with this show was proper pulp fiction. Intense drama, vicious and bloody violence, laugh out loud comedy, incredibly un-PC dialogue and brilliant, brilliant characterisation. The dynamic between all the cast is electric and the two main characters are all strong in their own right – Hap, the ex-hippy conscientious objector who spent time in jail for his beliefs and who’s just trying to get by with as little hassle as possible, and Leonard, the ex marine who’s dealing with being black and gay at a time it wasn’t really socially acceptable by carrying an incredibly large chip on his shoulder and a bad attitude. They’re really the only friends the other has and, as Hap says to Trudy, they come as “a package deal”. The show is based upon a book series written by Joe R Lansdale and this is reflected in the marvellously pulp fiction art cover credits. Cue binge-watch.